I just returned from several days at our Shanghai office. The Chinese culture is very interesting and there is always something new to discover and explore! One thing that is the same in China as here in the States is the interest in collecting coins. Coin collectors in China are very much like we are. China’s long and rich history combined with its many empires and regimes has resulted in many different coin types and varieties. There are many different collecting specialties. The coin market is very well established in China with coin markets in most major cities. Collectors around the world share the same passion for their hobby! What PCGS collecting tool do you use most frequently? Participate in the PCGS Newsletter Survey and you could win a 2009 $1 PCGS BU. PCGS Lead Photographer Phil Arnold discusses the details of the US Mint’s Artistic Infusion Program, which was created to take “coin and medal design in new directions.” But are the program requirements too restrictive to spur meaningful change? Read more to see Arnold’s own coin design and why it wasn’t eligible for submission. The first confirmed example of an experimental 1974 aluminum Lincoln cent struck at the Denver Mint has been authenticated, graded and certified by Professional Coin Grading Service as PCGS MS63. This amazing discovery coin will be exhibited for the first time anywhere in public by Heritage Auctions at the upcoming Long Beach Expo. How can you know if a particular coin is truly the best of the best? 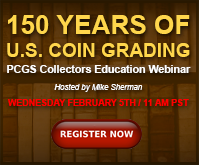 To answer that question, check out the PCGS CoinFacts Condition Census. The Census reveals some interesting information about what is available in the market, and how some coins are rare and underrated while others are common and overrated. This is information you can use to get an advantage in the marketplace. You can learn more about these fascinating tips by clicking here. Collectors Universe President David Hall first walked the Long Beach Expo bourse floor in 1966. What was the most popular numismatic item nearly 50 years ago? Was it 1957 flat pack proof sets? One dealer seemed to think so. David Hall recounts the popular items at the time and the long history of the West Coast’s top coin show. Legend-Morphy begins 2014 with its first of five scheduled Regency Auctions, once again being held during the PCGS Members Only Show at The Venetian/The Palazzo in Las Vegas, Nevada. This impressive sale includes many noteworthy lots and three particularly impressive collections: The Simpson Seated Quarter Duplicates Collection, The Blazing Peace Dollar Collection and the Abe "Bear" Grundstein Partial Box Collection.